Campbell Soup Man has delivered! It’s been the story of the last 3 years, minor leaguers come up with confidence and hot, only until Collins rots them on the bench. Eric Campbell has been an exception. Yesterday, Campbell drove in the winning run, with a single in the 8th. 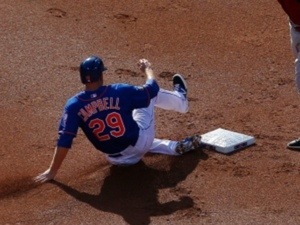 Campbell has shown that he can produce in the clutch and has a very low strikeout rate. If your going to only have one backup infielder, I would pick Eric Campbell in a flash.